Around 1920, the United States Naval Research Laboratory was researching how to reduce telegraph transmission times using magnetic recording. The idea was that recordings made at normal speed could be transmitted at high speed and recorded at high speed at the receiving end, thereby reducing the transmission time. Although this was never implemented due to the difficulty of high speed recording, AC bias was discovered by chance during the course of this research. In 1921, laboratory researchers Wendell Carlson and Glenn Carpenter discovered the AC bias effect while experimenting with magnetic recording when their amplifier oscillated unexpectedly, acting as a high-frequency bias. This invention was patented in the United States in 1927. Although this should have radically improved the performance of magnetic recording, it was overlooked as a means of improving recording, being primarily used for noise reduction. In the mid-1930s, Bell Laboratories carried out some research on AC bias with a view to improving the performance of steel wire/ribbon recorders. In 1937, Bell Labs developed the endless-loop style “Mirrophone”. A stereo-capable steel-wire model using AC bias was demonstrated at the 1939 New York World’s Fair. Dean E. Wooldridge of Bell Labs put in a patent application for the results of the AC bias research in 1939 and a US patent was registered in 1941. The patent was later given over to Marvin Camras from the Armour Institute/Illinois Institute of Technology and an improved version, later known as the Camras Patent, made a big impact in the world of magnetic recording. While AC bias was rapidly adopted by Armour Institute in 1941 for use in wire recorders for the navy and other applications, the sound recorders themselves still had the usual performance/ function limitations of wire recorders. While Germany had built the first modern tape recorder in the form of the Magnetophon, by around 1935, all magnetic recorders, including steel wire/ribbon recorders, were using the DC bias method invented by Poulsen. 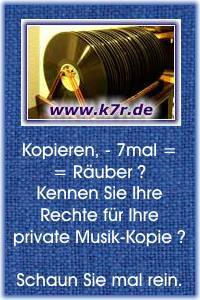 In 1938, the German state broadcasting company made the decision to use the K4(S) Magnetophon for broadcasting. Dr. Hans-Joachim von Braunmühl, chief engineer of the state broadcaster’s research laboratory, appointed Walter Weber to the task of improving the quality of the Magnetophon. In 1939, while experimenting with circuits, Weber discovered by chance (besser "by accident -durch Zufall) how high quality recording and playback could be achieved, radically improving sound quality in terms of frequency response, noise and distortion. Weber knew that this improvement was caused by abnormal oscillation in the recording circuit and eventually managed to make a recording using AC bias by chance. He spent some time examining the idea and formalised the AC bias method in 1940. In July that year he applied for a German patent. The adoption of AC bias saw rapid improvement in the performance of the Magnetophon, producing far greater recording and playback quality than could be achieved through DC bias. AEG prepared to introduce AC bias to the wider community by staging public demonstrations and other activities. In 1942, AC bias was used in Magnetophons for broadcasting. This enabled pre-recorded broadcasts of extremely high quality for the time to be transmitted all across Europe up until just before the war ended. Japanese research on magnetic recording began in the late 1920s. Dr. Kenzo Nagai of the Tohoku University Faculty of Engineering, who was researching voice delay devices with the idea that they would be useful in studying submarine acoustics, began researching magnetic recording after coming up with the idea of using a proposed recording on an endless steel wire as a delay device. This research developed into a study on the wire recorder and followed on to applied research, such as on proposed secret communications using magnetic recording. With collaboration from the university’s Institute for Materials Research, Nagai studied the most suitable material to use for wire recording and the Institute for Materials Research developed a magnetic material called "Sendai Metal" (an alloy of 40% steel, 40% nickel and 20% copper) which was very good for recording. In 1936, Nagai also carried out an experimental “pre-recorded broadcast” with NHK Sendai. Following on from this, he also successfully made a live recording of whaling in the sea off Kinkasan with collaboration from Anritsu Electric. Although he used a trial wire recorder for this experiment, it succeeded in recording aboard a rocking boat, which was impossible to do with a disc recorder. It was quite a long recording and had to be edited down to around ten minutes for broadcasting. Although it was quite a difficult task to cut and re-join the thin wire, it meant that pre-recorded broadcasts were now possible in an age in which live broadcasting was the norm. However, there was a lot of background noise in the recording and so pre-recorded broadcasts were deemed unsuitable for regular use in broadcasting. Accordingly, Nagai’s laboratory then set about researching noise reduction. Teiji Igarashi, a researcher from Nagai’s laboratory who had gone to work with Anritsu, was also researching applications for magnetic recording at this time. Igarashi discovered AC erasure by chance (ebenfalls durch Zufall) in an experiment and confirmed that this drastically reduced background noise. Although it did not improve sound quality, it was able to reduce noise without needing the existing method of DC erasure and was thus granted a patent. This motivated Igarashi to repeat the experiment to optimise the process by altering the AC frequency and intensity, thus perfecting the AC bias method. Given the fact that Nagai had achieved the same approximate results earlier than Igarashi and Anritsu had had technical advice from Nagai from the beginning, Anritsu Electrical and Nagai jointly applied for an AC bias patent, which was granted in 1940. AC bias is a method of recording in which a higher frequency signal (the bias signal) is recorded along with the recording signal. This method produces a better quality of magnetic recording than DC bias and is an indispensable means for improving the performance of modern tape recorders. This technology is now used in all analogue tape recorders. The higher the frequency of the superimposing bias signal, the greater the expected performance; yet wavelengths of between 30 kHz and 200 kHz are generally chosen, taking into account the saturation of the head. As shown in Fig. 3.14, the recording current flowing through the head during AC bias recording takes a waveform such as (c), produced by recording input signal (a) superimposing with bias signal (b). Recording should be achieved by this signal being applied to the head and the tape passing through the gap in front of the head. However, when a high frequency bias current is superimposed with the input signal (here, the sound current), a recording current as shown in Fig. 3.15 (B) flows through the head, generating an alternating magnetic field. Looking at one point on the tape that has passed through, the magnetic feld changes, as shown in Fig. 3.16, and the fnal magnetisation is recorded (the south pole in the case shown in Fig. 3.16). Since the strength of the magnetisation is proportionate to the input signal, it is possible to record with very little distortion. This is represented on curve B-H in Fig. 3.17, which shows the changes in the magnetic field affecting the tape. AC bias recording means that the tape is temporarily magnetised to saturation, so that recording can take place irrespective of the initial magnetisation curve. Where the input signal is 0, the tape magnetisation is also 0, meaning it has been AC erased. Sections 3.6.1 to 3.6.3 discuss the progress of research in various countries. It is interesting to note that in each case an unexpected oscillation in the amplifer during an experiment caused a successful result purely by chance. In each case, researchers also came to the conclusion that erasing residual magnetisation would produce better recording quality. While AC bias could be considered to be a more intuitively elusive phenomenon than DC bias, it was made to work by chance and ended up becoming a vital technology that vastly improved the recording quality of tape recorders. In July 1945, two months after Germany surrendered, John Mullin of the US Army Signal Corps encountered the Magnetophon at a radio station on the outskirts of Frankfurt. Mullin, who had been investigating German communication technology, was captivated by its performance capability. By the end of the year, he had acquired several machines and dozens of tapes, immediately sending them off to the United States for a more detailed analysis. With the help of a friend at home in San Francisco, Mullin set about repairing and improving the confscated Magnetophons, replacing the DC bias system with AC bias (the Magnetophons he acquired were the old K4 models that used DC bias) and redesigning the electrical circuits and began to make some test music recordings (Fig. 4.1). He created a major stir on 16 May 1946 when he demonstrated his new and improved Magnetophon at a meeting of the IEEE in San Francisco. Anmerkung : Das ist die von Mullin und Ampex über jahrzehnte lancierte John Mullin Story. Einges daran stimmt so nicht und wurde vom Marketing aufgehübscht (improved). Schaun Sie mal rein in diesen Intelligence Report von 1945. Despite being a small-scale start-up company, Ampex Co., Ltd. was very interested in this demonstration and set about developing its own model with a frm belief in its potential. While it was difficult to set a direction and goals for this project to develop a completely new product, the company was able to develop a playback head with advice from Mullin. With positive cooperation from Mullin, such as providing his own Magnetophon until the company was able develop a drive train, the playback head developed by Ampex did wonders for the performance of the Magnetophon. The company then worked on other developments, such as a recording and a erase head, and managed to complete the Ampex 200 model by 1948 (es war Ene 1947)(Fig. 4.2). As pre-recorded broadcasts began to dominate American airwaves, it was a major concern for the “Bing Crosby Show”, a popular radio programme at the time that was on its way to being broadcast nationwide, to maintain the sound quality of the recording. Bing Crosby staff members investigating the use of the Magnetophon for making high quality prerecorded broadcasts were very interested in the Ampex 200 demonstration and offered to help with getting the system introduced to radio stations. Starthilfe kam von "Bing Crosby Enterprises"
Being a newly founded company, Ampex had no marketing channels through which to target radio stations. It signed an agreement for the marketing to be carried out by Bing Crosby Enterprises and soon the Magnetophon was being delivered to the ABC to be put to use in radio broadcasts. With the 200 model accepted for use by radio stations, Ampex released the improved 300 model in 1949, establishing its firm standing in the feld of tape recorders for business use. Compared with the existing disc recorders, the machine was ground-breaking in terms of its sound quality, ease of use and ease of editing. Its popularity immediately spread to other areas such as recording studios and movie sound recording. While Ampex developed the 200 model tape recorder, disc recorder manufacturers "Audio Device" and "3M" appealed to Ampex to provide information and guidance in developing tape media. The Magnetophon had given these companies a glimpse of the huge potential of magnetic recording, that is, the tape recorder, in place of the disc recorder and they were very interested in magnetic tape as a new product. While 3M had no experience with recording equipment, it was a very experienced chemical developer, and made a full-scale entry into the feld of magnetic tape, developing the famous “Scotch Magnetic Tape”. The company’s superior technical competence enabled the production of magnetic tape that offered extremely stable performance for its time. It produced the famous “Scotch 111”, which became the standard tape for tape recorders all over the world (Fig. 4.3). While Ampex was working on developing the tape recorder, several other US companies also began developing this new recording technology. While some companies became interested after being inspired by Mullin’s demonstration of the Magnetophon, others were working on developments completely unrelated to the Magnetophon. Magnecord, a Chicago company founded in 1946, introduced the SD-1 wire recorder as its first product and continued developing new products. With a strong proposal from the sales end, the company put its steel wire development on hold and started working on tape recorders. In May 1948, the company exhibited its first prototype at the NAB Show, gaining considerable popularity. This machine was called the PT-6 (Fig. 4.4) and was priced far lower ($499.50) than the Ampex 200 ($3,825). Its small casing also attracted more user interest than the large, console-style 200. While the Ampex 200 had a three-head confguration allowing recordings to be monitored for business use, the PT-6 was not really suitable for business use, having only two heads: one for erasing and one for recording/playback. Two heads became the standard configuration for household tape recorders, as cost was an important factor and the two-head confguration offered the basic recorder functions. Nevertheless, the Magnecorder switched to three heads in 1950 to meet the demand for a proper business machine. In 1949, a Hawaiian Japanese radio station brought a Magnecorder and some Scotch 111 magnetic tape to NHK in order to record the popular amateur singing radio programme “Nodojiman Shiroto Ongakukai”. In August that year, several Magnecorder PT-6s that had been used in relay recordings of the national aquatics championships in Los Angeles were brought to Japan by an NHK engineer and tape recorders began to be used in radio broadcasting in earnest. From 1951, the post-war-founded commercial broadcasters began to use the PT-6. Thus the Magnecorder was the first tape recorder to be brought to Japan and put to practical use. This machine provided much inspiration for domestic tape recorder development within Japan. Anmerkung : In seinem Buch beschreibt Akio Morita, der SONY Gründer und Chef, das etwas anders. Er hatte anfänglich einen steel-wire recorder als Vorbild, für den ihm aber keine Firma in Japan Stahldraht oder Band liefern wollte, und dann einen Brush Papierbandrecorder als Vorlage. A great number of companies appeared in the United States between 1947 and 1950, manufacturing and marketing tape recorders firstly as business machines used by broadcasters and also for household use. While some of these were well-established business equipment companies that had been making disc recorders since the pre-war era, some of them were new players attracted by the new market. With multiple manufacturers producing tape recorders according to their own standards, there was little compatibility between recorded tapes. This limited their scope of use and presented an obstacle to the advancement of this long-awaited technology. As tape recorders became more widely used in broadcasting, this issue clearly worsened. Since radio broadcasts had been popular in the pre-war days, there was an association of commercial broadcasters in the United States called the "National Association of Broadcasters" (NAB)*. Given the use of sound recorders in broadcasting, the NAB had already established the Recording and Reproducing Standards Committee in 1941 for the disc recorders. In 1949, this committee extended its jurisdiction to regulate the necessary terms, measurements and characteristics of tape recorders as well. The NAB standards became the de facto global standards for consumer use as well and were implemented as national standards in many countries around the world. This ensured a minimum level of compatibility in the open-reel era. * The National Association of Broadcasters, an association of commercial broadcasters in the United States, was established in 1923, having thus been in existence for 90 years. The NAB holds an annual convention in the United States as well as world’s largest exhibitions of broadcasting equipment (many of the recent exhibitions have been in Las Vegas). The Recording and Reproducing Standards Committee exists within the organisation of the NAB. Following the Second World War, this Committee set the standards for disc and tape recorders for broadcasting use and, together with the RMA (later RTMA, now EIA), has long been known in Japan for these tape recorder standards. Although Germany was home to the advanced technology that produced the Magnetophon, its defeat in the Second World War left its magnetic recorders lagging behind. As an advanced chemical product, magnetic recording tape had been produced by the major chemical manufacturers and was in frequent use by broadcasters for pre-recorded broadcasts in pre-war Germany. After the war, the production of magnetic recording tape in Germany was resumed by Agfa in 1949 and BASF in 1950. In 1954, nine years after the war, the freshly-outfitted Magentophon M5 (Fig. 4.5) was finally released by Telefunken, a subsidiary of AEG, for semi-professional use, followed by a model for home use in 1958. In 1952, AEG released the KL-15D, a combined record player and tape recorder for home use. While the Magnetophon was thus revived several years after the war, a significant portion of its tape recorder technology was publicly known and other European manufacturers who had previously worked with steel wire recorders and other technology were now developing their own tape recorders and putting them on the market. The tape recorder was advancing across Europe as a business machine, with British company EMI producing the BTR/1, a copy of the Magnetophon for professional use in 1948 and Swiss company Studer producing the Dynavox for semi-professional use in 1949. Anmerkung : Es ist unerklärlich, daß hier der Name Max Grundig fehlt, der 1952 mit dem Reporter 500/700 einen Meilenstein gesetzt hatte. Denn weder AEG-Telefunken noch irgend eine andere Firma hatte das Magnetbandgerät wieder in den Markt eingeführt. Das war Max Grundigs persönlicher Verdienst. Studer was a small electronics manufacturer founded in Zurich, Switzerland in 1948 by Willi Studer. Not long after its founding, Studer began to import tape recorders from the United States, inspiring the company to make its own developments on the tape recorder. It started out by remodelling the imported American tape recorders to European specifications and completed its first tape recorder in 1949: the Dynavox. Although it was a small-scale company with limited human resources, equipment and capability, it succeeded somewhat in business due to the novelty of the tape recorder. With this experience under its belt, the company improved its design and released the T26 in 1951, under the new brand name of Revox. While the Dynavox and the T26 were developed and marketed as general use (albeit highly-priced) tape recorders, Studer developed the 27 model, based on the T26, as a tape recorder for business use. This machine was trialled at music events and was favourably received. In 1952, the Studer 27 went into full-scale production (Fig. 4.6). Through the success of the Studer 27, the company gained a reputation as a manufacturer of business-use tape recorders, leading the post-war high-end tape recorder market together with US company, Ampex. The Revox brand produced a succession of high-quality tape recorders for general use. The 36 series, which originated in 1955 with the A36, had stereo capability and continued to dominate the market through to 1967, when music lovers and audiophiles fell for the sound quality of the A77 (Fig. 4.7), considered to be the best general use tape recorder at the time. Despite being very highly priced, it was extremely popular, with hundreds of thousands sold all over the world. While the tape recorder was a magnetic recording device and relied more heavily on electrical systems than the gramophone, the major factors determining its performance in the pre-digital-recording era were the tape drive system and the mechanism allowing accurate and stable operation. It was a precision instrument requiring a high working accuracy and an assembly system, so there was no better place for it than Central Europe, where the watchmaking industry had developed. Studer was founded in Switzerland, yet it was another Swiss company in Lausanne that produced a unique recorder exemplary of post-war Europe: the Nagra. Warsaw-born Stefan Kudelski left his homeland of Poland during the Second World War. He eventually settled in Switzerland after living in Hungary and France. In 1951, in Lausanne, Kudelski built a small, lightweight, portable tape recorder with a focus on sound quality. He named this machine Nagra, meaning “to record” in Polish. The first Nagra I was bought by a local radio station in 1952. Although radio stations in other areas also placed orders for the Nagra I, it was little more than a prototype model and had a number of defects. Kudelski completed the signifcantly-revised Nagra II (Fig. 4.8) and began to manufacture this model by the end of 1953. Though portable, the Nagra had a very precise and technologically advanced tape operation system and presented a wealth of possibilities to diversify the scope of the tape recorder. The Nagra III debuted in 1959; this model had a systematic operation function, which could be used in synchronisation with a cine-camera for cinematography, for example. The Nagra continued to rank highly as the high-performance portable business machine of the tape recorder industry, used by film studios and broadcasting stations throughout the world. Brimming appeal with its maintenance-oriented design for business use, its precisely-manufactured parts and the sharp, unique feel of its operation, the Nagra became the landmark design for many tape recorder designers. As an integrated system with a number of peripheral devices for synchronisation with cinematography, it enjoyed a long reign as the main sound recording equipment used on film sets. The Nagra’s role in this industry finally came to an end as digital recording equipment and digital voice processing rapidly replaced analogue equipment. Although "Anristu" and "Nippon Electric Company" (NEC) began to develop and manufacture steel wire recorders around the late 1930s, they lacked development experience in many areas, such as sound quality and operation; as a result, they were not able to produce anything capable of being used in broadcasting in the pre-war era. The fact that NEC launched a steel wire recorder in 1948 indicates that development had continued during the war; however, the recorder was not widely popular as it was very expensive (Fig. 4.9). As mentioned in Section 4.1.2, the use of tape recorders in Japanese broadcasting started in 1949 with the American Magnecorder. The PT-6 model used was brought to Japan by NHK. Using this model as a reference and with collaboration from NHK, "Tokyo Tsushin Kogyo" (“Totsuko”, later Sony) and "Nippon Denki Onkyo" (later Denon) started working on a domestically-produced tape recorder. Development had finally begun on a Japanese-made tape recorder. Denon was an established company with various achievements as a domestic manufacturer of recording equipment for broadcasting both before and after the war, including supplying disc-style recorders to NHK. Its roots were in the "Denki Onkyo Research Institute" founded by Koichi Tsubota before the war to work on domestic disc-style recorder production. "Tokyo Tsushin Kogyo", on the other hand, was a new company, founded by Masaru Ibuka in 1946, that had developed and marketed several measuring instruments for electrical engineering and was constantly looking to work on innovative new products. Respective company founders Tsubota and Ibuka were contemporaries at the Waseda University Faculty of Science and Engineering, although it is not known to what extent the two men knew each other. Both companies built prototype tape recorders within a short space of time (Figs. 4.10, 4.11), which were then evaluated by NHK. The results of this evaluation were refected in the offcial demands that were submitted, while the prototypes were redesigned to meet NHK specifcations. The prototypes were introduced by NHK in 1951 as the PT-11 (Fig. 4.12) and PT-12 (Fig. 4.13), the frst domestically-produced tape recorders for business use, and were put to use by broadcasting stations all over Japan. It seems that the machines were treated as “portable”, with the tape transporter and amplifier each in separate casings. Photographs of the prototypes show the differences in approach between the two companies. Denon, with its wealth of experience in the field of broadcasting equipment through its disc-style recorders, was trying to emphasize guaranteed performance and credibility in the feld of business machines by making a faithful reproduction of the Magnecorder PT-6. On the other hand, while Totsuko adhered to the basic principles, it added some of its own original technology. From the outset, researchers at Tokyo Tsushin Kogyo were very interested in magnetic recording and had studied systems such as the steel wire recorder. Coming into contact with the tape recorder through the NHK, the researchers were convinced of the potential of this new product and concentrated their efforts on developing it. Despite the extreme scarcity of reference material, Totsuko showed incredible manoeuvrability for a start-up company headed by engineers, repeating a number of designs and prototypes in a short space of time. It seems the company was also examining and investigating the principles of magnetic recording, while its procurement of the purportedly indispensable “high frequency bias patent” from Anritsu indicates that it was preparing to ensure the superiority of its products through its unique technological developments. Having abandoned the early steel wire recorders in favour of the tape recorder in its work on magnetic recording, Totsuko worked on its own developments in spite of various hardships. While its first prototype was for the NHK, as mentioned in the preceding paragraph, the development of products for business use definitely contributed greatly to the company’s accumulation of technology. Although the scarcity of parts and materials and the lack of information and technology following the war meant that new product development was rife with difficulties, Totsuko finally released the “G” in 1950, the frst domestically-produced tape recorder. At ¥160,000, it was very highly priced. Although tape was also being developed and marketed, it was still the rudimentary paper-based tape. The physical properties of this tape, such as its smoothness, were still underdeveloped, which directly affected the recording and playback functions (Fig. 4.17). A major obstacle to Totsuko building a tape recorder was the lack of appropriate parts. In particular, the driving motor had to rotate at a constant speed; it had to be silent (a matter of course for sound equipment); it had to produce a certain level of torque. These criteria could not be met with the motors from general electrical goods, such as fans, so the company asked Denon for the use of its hysteresis synchronous motor developed for use in disc-style recorders. The company also had much diffculty finding a good rubber material to use for the power transmission unit idler and in other parts. Totsuko built up a diverse wealth of knowledge to improve the rubber belts and idlers, which later proved very useful in improving the performance of the Sony tape recorder, ensuring its predominance. Another major challenge was developing the magnetic tape. The researchers understood that coating a base material with magnetic powder would produce a tape that could be used for recording, but, with very little in the way of reference material, they were blindly guessing as to what they could use, both for the base material and for the powder coating. With the idea of simply proving the tape was magnetised, researchers ground cylindrical OP magnets into powder in a mortar and tried coating this onto a suitable paper material with a paste made from boiled rice. This experimental tape produced only noise. After various experiments, the researchers concluded that the ground-up magnets were too strong and that they should use a weaker magnet for recording. The use of powdered OP magnets as a magnetic substance was the same method used for the later metal tapes, but perhaps the level of technology at the time meant that the heads were not able to magnetise a highly coercitive magnetic substance. The Totsuko research team searched through various sources of literature and found that if a substance called ferric oxalate is oxidised by burning, it becomes ferric oxide. Despite the lack of materials, they managed to acquire a ferric oxalate reagent and immediately set about heating it in a frying pan. The yellow ferric oxalate turned brown and then black; by observing the colour and taking it off the heat at the appropriate time, they were able to produce ferric oxide powder without any problem. To coat this powder onto the base material, they started out by using a spray gun, but this wasted a lot of the powder. Through trial and error, they ended up creating a prototype by applying the powder with a brush. They made repeated recording experiments on a primitive experimental recording device made from a pair of 78 RPM record turntables. They improved the magnetic substance and made various analyses of different choices of base material, but at that time there was no paper or plastic in Japan suitable for use as magnetic tape. They had no choice but to leave it to a paper expert and enlisted the help of Honshu Paper Co., Ltd., which showed a great deal of interest in the development of the new product, as it could potentially supply the base material for the paper tape (Figs. 4.14, 4.15). Following these developments on the magnetic tape and the machine itself, the “G”, Japan’s frst tape recorder, was released in 1950. Totsuko started marketing the G under the trademark “Tapecorder”. Although customers were interested in the novelty of it, it was not readily accepted as a general household item, as it was expensive, big and clumsy, with no obvious usefulness. It was mainly used by public organisations, such as for recording courthouse proceedings. This was what had been foreseen, with even the letter G standing for “government”. Totsuko started out marketing in the belief that the popularity of this ground-breaking product would also spread to household use as well. However, although there was some interest in the product, this interest did not really translate into sales. Totsuko reviewed its rather optimistic policy of “if we build a good machine, it will sell” and focused its attention on raising public awareness and advertising the tape recorder, creating a manual to explain the uses and benefts of its top tape recorder and redoubling its sales activities (Fig. 4.18). The company also continued to develop the product to try to lower the price and increase its ease of use. With technology, patent strategies and marketing as its weapons of choice in the popularity stakes, Totsuko was laying the groundwork for it to become Japan’s leading tape recorder manufacturer. As mentioned in Section 3.6, AC bias was discovered by chance in the 1920s during research on magnetic recording, but it was not until the late 1930s that research began in earnest throughout the world on how to improve the performance of magnetic recording. This coincided exactly with the start of the Second World War. Since recording technology had definite useful military applications, such as broadcasting and voice recording, the exchange of technology between countries was stopped until after the war. After Germany’s defeat, the Magnetophon – the most advanced technology of the day – was taken and studied in detail by the victors. As a result of the ensuing rapid technology transfer, better, more modern tape recorders were developed and put to use. AC bias came to be recognised as an indispensable piece of technology for high quality recording and playback. Totsuko began developing the tape recorder in Japan after the war. As well as making its own tape, it also set about carefully examining relevant patents on AC bias, having found that AC bias was necessary in order to be able to commercialise the tape recorder. The patent for AC bias in Japan had come about as the result of research by Kenzo Nagai of Tohoku University and Teiji Igarashi, one of Nagai’s assistants who had continued the research at Anritsu Electric. The patent rights were held by Anritsu (Fig. 4.19). After negotiating with Anritsu, Totsuko took over the patent rights for AC bias in October 1949. As this was a huge investment for Totsuko at the time, the company bought the patent jointly with NEC. The Nagai Patent had been granted in Japan in 1940. Although a US patent had also been applied for, the procedures had been interrupted by the war. In the meantime, the Camras Patent had been established as the patent for AC bias in every other country except Japan. The domestic Japanese tape recorder market developed rapidly from the launch of the G in 1950. The AC bias patent proved to be a major weapon for Totsuko to keep other companies out of the marketplace, enabling the company to hold on to its high market share in tape recorder sales. Around this time, the US trading company Balcom began large-scale import and sale of US-made tape recorders in Japan. Totsudo and NEC complained that this was an infringement of their AC bias patent rights and repeatedly issued Balcom with requests to either pay royalties or stop selling. Balcom repeatedly ignored them, so Totsuko presented its case to Tokyo District Court in September 1952. This turned into a major case for Balcom, involving even the "GHQ", but Totsuko eventually won the case. During the course of the proceedings, the US patent holder, Armour Research Foundation, came to Totsuko’s attention. Thinking that its exports might be affected, Totsuko reconciled with Armour and the two entered into an agreement of mutual technological assistance. Totsuko stood firm on patent permission with regard to Japanese manufacturers as well. In 1954, "Akai Electric Company" launched a tape recorder kit featuring a “new AC bias method”, which ingeniously incorporated a bias circuit (Fig. 4.20). Totsuko immediately objected that this was a patent infringement, but Akai Electric denied this as it “did not violate the Nagai Patent”. Although the matter went to court, Totsuko decided to reach a settlement, in light of its isolation in the industry as well as other circumstances. Nevertheless, fierce competition continued in product development. With the Nagai Patent licence due to expire in 1955, many manufacturers, including major electrics companies, were anticipating getting involved in the tape recorder industry. However, the patent licence was extended for another five years on the grounds that the patent was not able to be put to use during the Pacifc War. A number of companies that had been making preparations to enter the industry clearly opposed Totsuko and the Ministry of International Trade and Industry. Although Totsuko continued to refuse to licence the patent rights, by 1958 the manufacturing latecomers were granted consent to use the Nagai Patent. Fierce competition ensued in the development and marketing of new products, and Japan’s tape recorder industry was making tremendous leaps forward.